by J.G. Ballard, 2009, 1216pp. TLDR: 3 out of 5 for a huge collection of stories - a few are awesome, a few not, most in the middle. I've been working on this one for a few years, now - listening to the audio book, which at 6 roughly 9 hour-long sections for a single credit was an amazing deal. The nice thing about a mega short story collection is that you can digest it at your leisure. 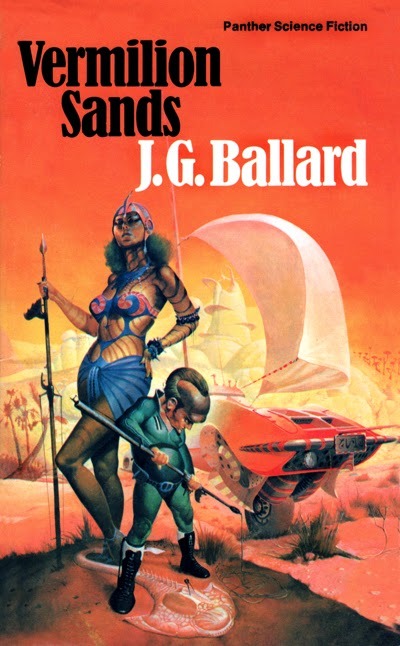 Ballard's stories cover a lot of ground but he returns to some themes more often than not. These themes include sound, flight, changed worlds, displacement in time, and the post-apocalyptic life, and amusement parks. He also likes odd pairings, whether they be conceptual things like sonic flowers or clinical poetry, or odd couples like the man who was wed to a mannikin. He also writes of odd environments, full of glass and curves, but also of decay. In many of his stories there's a sense that civilization passed a long time ago and there are but a few remnants left. Most of these stories take place on earth, and many on beaches or islands. One recurring locale is the Palm-Springs like resort called Vermillion Sands, a refuge of sorts for modern Woosters. Ballard has a clear and colourful writing style that almost always seems playful, even when he's expressing his concern over the state of American politics - which he does often. Wonder what he would think of what's happening today! Many of his stories have subtle endings which leave the reader to draw their own conclusions. Other memorable stories include The Concentration City, in which a young man in the city of everything comes up with the crazy idea that there might be 'empty space' somewhere, and he goes off in search of it by riding a train only in one direction to see where it will go. In The Bilennium two men in the crowded city discover a forgotten and sealed off larger-than-average room in their living complex and move in. They soon invite their friends, who in turn invite their friends, and before you know it it's just as jam packed as everywhere else. In War Fever it is revealed that the city of Beiruit is a quarantined pocket for the study of war, where the citizens undergo hardship for the good of everyone else. In The Smile a man tells us the story of his relationship with a mannequin, reciting the tale as if she was a living, breathing woman. I thought this one was very cleverly written. Not every story was a winner for me - quite a few I found to be rather dull, and the earlier stories were stronger than the later ones, overall - but nevertheless there was a lot of good material in this collection. I thought Ballard was most entertaining when he was being playful, most engaging when he was being critical, and most boring when he was being political. Of course, that probably says as much about me as it does him. Big Ballard fan but I agree his early stories are generally better although I enjoy some of his later avant garde shorts in The Atrocity Exhibition.